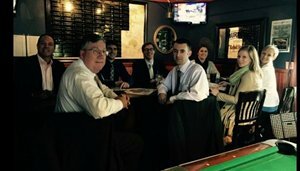 This month a group of Legacy Trust employees and myself enjoyed burgers at Logan’s Alley, with a portion of the proceeds going to the Children’s Assessment Center. If you are not aware, the CAC is an excellent organization in our area that provides a vital service to the children in our community. The main purpose of the CAC is to provide safety, support, and counseling to children who have been a victim of sexual abuse. While many of us cannot believe that this happens to children in our society, the truth is that it does happen and it happens more often than we think. Fortunately, groups like the Children’s Assessment Center are readily available to help out and create a safe environment for the child. As far as the burgers go…. Logan’s Alley proved to be an excellent burger joint and definitely jumped to the top portion of my ever-growing burger list. For those of you who do not know, Logan’s Alley is located on Michigan just east of College. It is a unique, tavern-like building that cannot be missed. Since there was a group of about 10 of us, we were able to collectively try all of the burgers on the menu, ranging from a build your own style to the Logan Burger. My burger of choice was the Gridiron, which came as two patties loaded with haystack onions, Gouda cheese, and BBQ sauce. The burger was delicious and left little to be desired. I would strongly recommend Logan’s Alley to anyone in the neighborhood who is looking for a good spot to eat or drink (as they have over 200 bottled beers on hand).